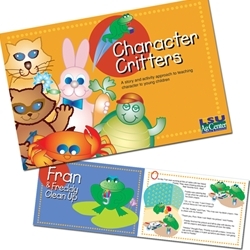 The Character Critters Storybook is ideal for parents or grandparents to read to their children/grandchildren. The storybook includes six separate stories that talk about being fair, trustworthy, responsible, respectful, caring and a good citizen. Order 25 or more copies to receive a 25% discount. Discount will appear in your shopping cart.